How to upload a file (eg. PDF, image, document)? Step 1) Login to your All-in-One Back Office. 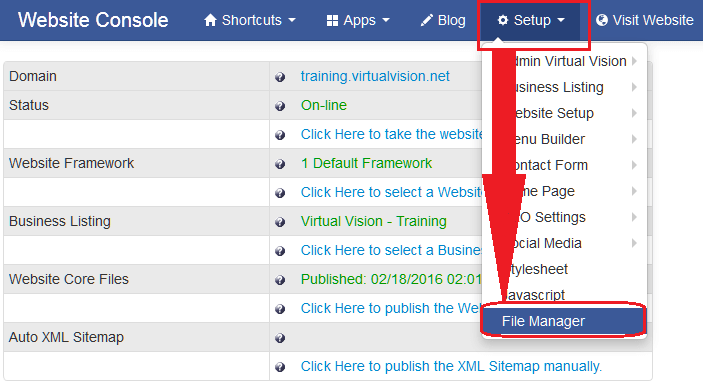 Step 2) On the top-menu bar click on 'Setup' then click on 'File Manager' from the drop-down list. Step 3) For a PDF ensure the 'File' folder is highlighted. Images would go into the 'Image' folder. Then click on 'Upload'. Step 4) Locate the file from your computer and then click on 'Open' to upload the file.